Scancat-Gold for Windows supports all the features of the PCR1000 (** see below) and the smaller PCR100. Our innovative approach to the PCR's Bandscope actually increases your viewing bandwidth to over 500KHZ (Icom's only shows 200KHZ). Plus we also show a 'slide rule' graticule of the bandscope for easier identification of 'off frequency' signals. 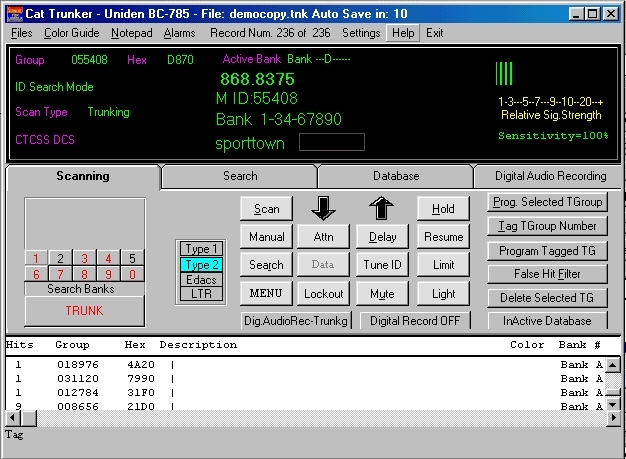 PLUS many of Scancat's ''Regular'' features add new dimensions to the support furnished with your OEM software, including: Unlimited frequency banks (records). Multiple search ranges & disk files, and much more! Most of the Radio Shack scanners only support programming via a "Cloning" method. So they cannot be controlled (as with the Scancat-Gold version). Only the Scancat-Lite-Plus will work with these radios. Scancat-Gold for Windows now supports the BEARCAT BC-296, BC796, BC-250, BC-785, BC-780, BC-245 and BC-895 TrunkTrackers. This unique desktop scanner from Uniden, has 300 memories that can be programmed for either conventional or Trunking Channels. PLUS Scancat can control not only the conventional operations of the BC-245/895, such as scanning, logging, spectrum analysis etc. but now does FULL TRUNKING ! Scancat permits you to selectively load the banks of the radio with all your favorite trunking frequencies and trunking group ID numbers. Of course Scancat can also read the radio's memory contents to files, including conventional trunking information. In addition, we can supply the serial cable (BC-895) that is necessary to connect the BC-895 to a computer. Buy the Software and Cable as a package, and save even more ! One recent review said we support "almost every radio on the planet!". Well... (on the Planet Earth) almost. With Scancat's support of over 85 radios, from over 10 Manufacture's, your software dollars go a long way. No need to buy several programs, one for each radio you own. The chances are high that we already support all of your existing scanner and receiver equipment. And the best part is....all the equipment is supported in one program, no need to purchase seperate "drivers". You can spend a lot more $$$$$$, but you'll never find a better value than SCANCAT-GOLD for WINDOWS. 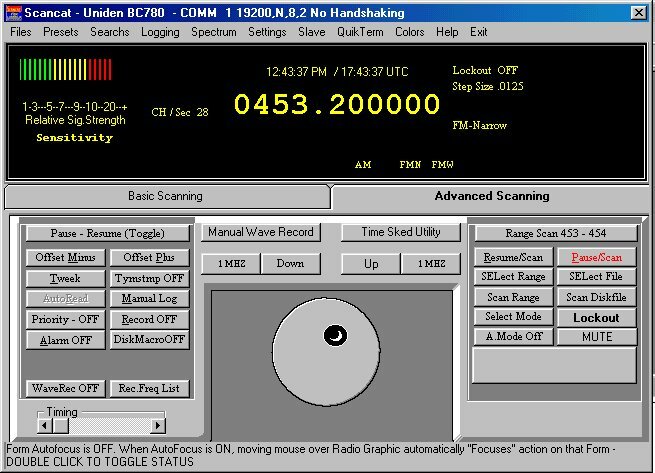 SCANCAT-GOLD for WINDOWS is tested by Hams and Shortwave listeners like you who own the equipment we support. The results? SCANCAT-GOLD for WINDOWS has MANY new features. SCANCAT-GOLD for WINDOWS has a NEW more comprehensive manual. We also use extensive BETA testing before releasing our new product. The results are a program that is USER designed. Our one program RUNS ALL THE RADIOS WE SUPPORT. If you own more than one radio or purchase another in the future, you never need to buy another computer control program. SCANCAT-GOLD for WINDOWS is not copy protected. Use on as many computers as you wish. With our new Scancat-Gold for Windows there is included at no extra charge, SCANPORT, an all purpose conversion utility that will read your word-processor text files, and convert them into SCANCAT frequency files ! Scanport for Windows also has several utilities to automatically read several CD-Roms, PLUS immediatlly use Betty Bearcat's DBASE export files without even converting !. SCANCAT-GOLD for windows will now let you Read AND Scan directly, D-Base, Access and Btrieve files. No Conversion necessary!. So, with SCANCAT you have a built in ability to use those "really big" databases .... Immediately ! MOST Yaesus including FRG-8800 & FRG-9600. + FRG-100, FT-840 and MORE. Uniden's new BC895 Trunk Tracker. BC895, 245 , 870, 250 and 785. 1. Enter any one frequency and increment up-down from that point. 2. Enter any two frequencies and scan between them with ANY increment and variable time delay or pause. 3. Scan a file of frequencies, search by description or wildcards. 4. Create Databases of freq.files. Sort by any field, and save to disk or printer. 5. Link up to 100 personal "Preset" frequency BANDS for SW, aircraft etc. including increment and mode. The most popular presets are included in the program. 6. Link up to 100 personal frequency FILES for SW, aircraft etc. With KENWOOD, ICOM, AOR and NRD-525/535 and most newer YAESU'S you can read to a file the radio's memories including the split Channels and mode and store them on a disk file. "Totally awsome' !. With radiios that support squlech detection or signal strength feedback to the computer, The Spectrum Analysis gives you a detailed view of hits and signal strengths. ALL WHILE SCANNING AND LISTENING! Just 'skate' your mouse over the spectrum screen to get an instant frequency readout on any point. PLUS, click anywhere on the spectrum graph to instantly tune your radio. Even use it like a 'slide rule tuner' ! The software system (Including on-line Help) implements a true windows style pop-up interface and is extremely user friendly. This is not just a 'dos program in a windows wrapper'. but an application written FOR windows. Over a Year in development, we have constantly Beta-tested SCANCAT to create an easy to use and bug-free program. With SCANCAT you can create unlimited files of up to 400 frequencies each. AND, WITH THE NEW SCANCAT-GOLD for WINDOWS, you have unlimited file sizes. The files can be sorted by any field, (Description, frequency etc). You can create these files while you are scanning between one /or two frequencies. You can also access several pre-programmed (user re-programmable) "split offsets" such as for marine telephone. Press a button and log/add the entries to a disk file, complete with optional description, timestamp and comments. SCANCAT will optionally check for either description OR frequency duplicates, eliminating multiples on long searches. After several hours, you can build a log-file of the found frequencies, including the number of times found and the last signal strength. You can pop up our "active' l spectrum chart of this analyisis at any time WHILE scanning. SCANCAT-GOLD for WINDOWS has our exclusive, QUIKTERM, an integrated communications program to access a TNC. (Demodulator).. 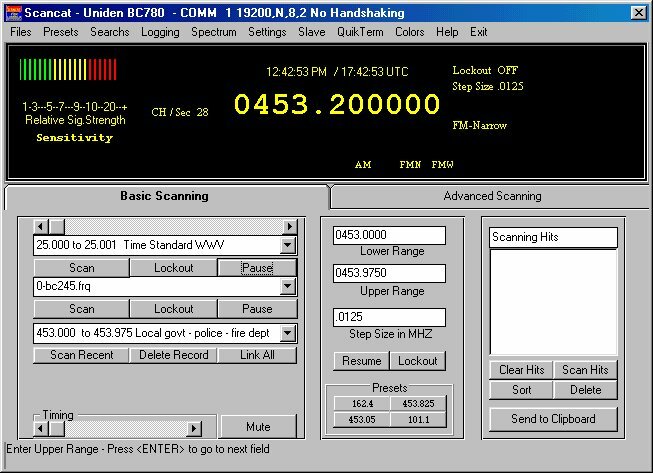 If you own a MFJ, PK232 or M7000 type demodulator for RTTY, or packet, you can instantly go back and forth between scanning and using the demodulator. The Communications program is built in to SCANCAT, not just an extra program. QUIKTERM uses split windows for receive and sending of your demodulated signals, as well as supporting disk & printer Spooling of your output. 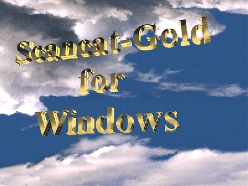 SCANCAT-GOLD for WINDOWS is the result of YOUR ideas and feedback. Our programmers have worked hard to produce the best Computer Control program on the market - a claim that we would like to prove. You are going to be amazed to discover a level of unmatched ease and functionality. SCANCAT-GOLD has many NEW features. We've spent countless hours pouring over requests from users like yourself to assure that the system we developed met and exceeded your needs. As a result, when you choose SCANCAT-GOLD you'll be using a truly advanced program that provides you with optimum use and simplicity. SCANCAT-GOLD is the best that we can produce. Of the many new features in SCANCAT-GOLD these are but a few that we just can't resist pointing out, features that will truly enhance your scanning efforts. MULTIPLE SCANNING BANKS. Yes now you can actually scan several different frequency banks (up to 100 in fact) in the same pass. Click on any range to instantly change to that scanning.Toggle any or all on/off as you please. MULTIPLE SCANNING DISKFILE BANKS. Yes now you can actually scan several different frequency FILES in the same pass. (up to 100 in all). Click on any file to instantly change scanning to the one selected. UNLIMITED FILE SIZES. The 400 frequency barrier per file is gone forever. With SCANCAT-GOLD the number of records you can have in a file is now only limited by your disk space! DUAL RADIO SIMULTANEOUS SCANNING (ICOM ONLY). If you own TWO Icom radios, one HF and the other VHF, you can program SCANCAT-GOLD to run 'em BOTH at the same time. Only ONE CT-17 Icom interface is required! COMMA DELIMITED CONVERSION. Many database applications EXPORT their files for use by other systems in comma delimited format. SCANPORT-PRO can read and convert these to a SCANCAT frequency file for immediate use. D-BASE SUPPORT. SCANPORT-GOLD can read and scan directly D-BASE files. D-BASE is the single most popular format used by 2nd party vendors for frequency database's. (PERCON AND GROVE Enterprises frequency database for instance). DIRECT IMPORT OF PERCON’S CD-ROM EXPORT FILES. DIRECT IMPORT OF MR. SCANNER’S CD-ROM EXPORT FILES. DIRECT IMPORT OF TRS Consultant's SCHEDULES. Convert SCHEDULES (tm) Showrtwave Files Directly to a Scancat file. All Automated with no setups necessary. Exclusive MACRO CONTROL PER RECORD. Complete programmable control of Signal Threshold, up to 6 ALARMS, & many variable timing delays, such as hang & dwell time PER RECORD. You now have COMPLETE control of your database scanning. AUTOMATIC BIRDIE LOCKOUT and frequency bypass programming. WHILE scanning, lock out birdies, and even let SCANCAT build your own lockout table. Instant keypresses lockout unwanted frequencies. TOP HITS TABLE. While SCANCAT-GOLD for WINDOWS is scanning, you are building a "TOP TWENTY" HITS table. Pop it up anytime you want. Pick up on sudden activity instantly for optimum scanning enjoyment. CTCSS AND DCS tone search support with Opto Electronics boards or the DC-440 Tone reader used in conjuction with ICOM and CI-V interfaces. NEW MORE COMPREHENSIVE MANUAL. SCANCAT'S so easy to use you may never need it. You get a professionally bound manual of over 150 pages, indexed and cross referenced to help you find features quickly. We have added a "by radio" lookup for help on your specific radio's features and operation with SCANCAT. The Proven LEADER in Computer Aided Scanning. Since 1989 ! IF YOU ACT NOW....you can have our latest "disk full of frequencies" for just $15.00. This disk has over 3.5 MEGS (in a zipped file) of "stuff" ready to run. See our catalog for a complete listing.